When Mic and Ignacio approached me about heading north to the state of Sikkim I immediately said yes. I figured out quickly Darjeeling would be hard to make friends in with the entire town closing by 8pm and most foreigners were either couples or with a group tour. I thought of trekking around Darjeeling but it required an overpriced guide but in Sikkim we could make our own trek. The French couple also joined making me the 5th wheel, but I never once felt left out. So Monday morning we took off to get our permits (free but necessary to enter this Indian state) and promised we’d not cross a Tibet/China/Nepal border. Grabbed a shared jeep and headed North to the second richest state in India. sidenote: shared jeeps are the main transportation in the Himalayas and cram 12 people (4 to a row) in one car. Sometimes more, some sit on the roof or hang off the ladder, but the jeep doesn’t leave the stand until it’s entirely full. Whoever is squished next to the driver literally has the stick-shift between their legs. 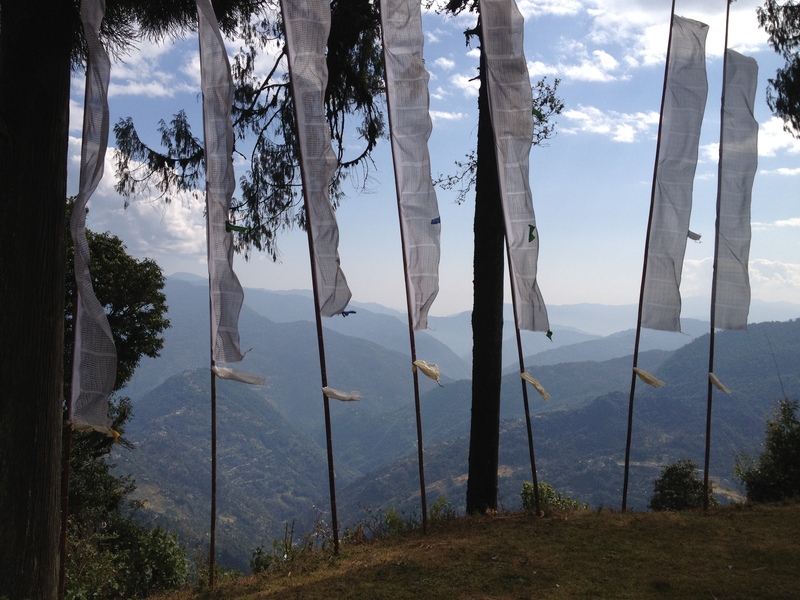 We planned out a mini trek which is called the Monastery Loop and started in the town of Pelling. I was thankful for Mic and Ignacio because they shared a 3bed room throughout our time in Sikkim so I wasn’t alone. We woke up to an unbelievable view of Mt. Khangchendzonga (3rd highest peak). I swear the Himalayas leave me breathless every time. That day we hiked up to the Pemayangtse Gompa, which means Perfect Sublime Lotus in Tibetan. Built in 1705 this is a red hat monastery meaning they practice tantric meditation (instead of working towards enlightenment, they picture themselves as a God already achieved enlightenment) and follow a different lama. The Dalai Lama we all know is the leader of the yellow hat Buddhists who believe in peace and compassion for all beings. Just like any religion and all the branches it gets confusing, but anyway we sat in on morning prayers and listened to the monks chant and meditate. It’s beautiful to close your eyes and listen as they read off the teachings, play instruments, and make offerings; I just wish I could understand the language. From there we planned on trekking to Khecheopalri Lake but at 26kms away we’d get lost somewhere in the dark so we hung around the jeep stand begging for cheap rides. I literally stood in the middle of the street stopping every car but the only people who would take us were demanding ridiculous prices until finally our soon to be brother appeared. Not a taxi driver but just a good soul said he’d happy drive us as he lived near. Jigme is 32yrs old, parentless, works on an organic farm, and was so happy to make new friends. He first invited us into his family’s home and served us Hit beer, which would be our first of many. Then brought us to a cheap place for dinner and to stay at. We asked our new brother to join us on our trek which he happily agreed to. That night we continued to drink in celebration of Diwali – the Hindu version of Christmas that is known as the Festival of Lights. Though we were in a Buddhist area, celebrations still go on. We sat on the balcony of the GH drinking and lighting sparklers I bought. In front of us was pitch black except for random lights all over the valley so it looked like the stars continued above and below us. Around 8:30pm we got yelled at for being too loud at such an hour from some bia at our guest house so we decided to go find a Diwali party. We could hear faint singing coming from somewhere in the woods and we were up for the challenge to find it. With our torches strapped to our heads we took the tiny path deep in the woods to find the voices. After a while we couldn’t hear them anymore so I laid down in the middle of the road to stare at the stars. We sat there for a bit passing a bottle of Old Monk’s rum when all of the sudden the singing we heard walked right up the path I chose to sit down at. Todo Fluyo. These kids were Buddhist but wanted to celebrate the holiday by caroling through the surrounding villages to make people happy. How sweet. We of course joined them. For the next hour until their Aunts made us stop we sang, danced, and laughed a ton. Breakdancing, dance offs, cartwheels, and more the kids of India are beyond entertaining. Since we got to the lake when it was dark, we visited it the next morning. A dock of prayer wheels lead to the holy water full of catfish. Another very serene Buddhist site. From there we met up with brother to begin our trek to Yuksom. Sikkim is flourishing with beautiful wild flowers and delicious fruit. We snacked on clementines, guajava, and picked our own cardamom. After a good 5 hours of steep declines and inclines we arrived in Yuksom where the Diwali festival was just getting started. Each town sends a group of singers, dancers, and talent to visit other towns for the celebration. The main language is Nepalese in Sikkim so we enjoyed watching traditional Nepalese dances, songs, and even pop songs. Of course we began drinking again (Sikkim has no tax on alcohol, which makes it the cheapest booze I’ve found in India). Sikkimese like to drink as well and we found ourselves dancing with the entire town as fireworks went off all night. We rose early the next morning to begin another long day of trekking. That morning was the first hot Western shower I’ve had in well over a month. The hot buckets are manageable but you have to move fast because it’s freezing when you’re soaping yourself up. Happily clean we headed up to the Dubdi Gompa, the oldest monastery in Sikkim which was sadly damaged by the earthquake in September. From their we hiked up to the Hongri Gompa, which had a gorgeous view (see photo). There we had lunch and drank a vat of tongba or chhang, which is a warm alcoholic millet beer famous around the eastern Himalayan region. Might have drank a little too much and left a little later than we should have but hey it was a holiday and Brother wouldn’t let us leave until we finished it all (I didn’t really love the taste but was basically hazed to drink and drink by Brother). On we went unsure if we were on the right path but thankfully made it to PokhariDara. As we played with the children Brother bought us beer and we ended up drinking for an hour. Told we were only an hour away from our destination, we headed off as the sun was setting. An hour later and pitch dark we reached Sinon Gompa. Only 20mins down a steep path to Tashiding said the monk…with our torches out, we tipsily climbed down the mountain praying we’d make it alive to the town. After an hour, I was ready to be done. My blisters were brutal and we were going on 10 hours. Brother had never done any kind of trek like this but continued to say yes this shortcut and my bitchiness began. I don’t know how we survived without losing someone off a cliff but I almost kissed the ground when the town appeared. Found a cheap hotel and cheered with more Hit beer and the end of our Sikkim trek. We easily walked more than a marathon up and down those mountains but it was well worth it. Todo Fluyo. Back to Darjeeling we went where I had three days to search for my Great Great Aunt Pearl’s grave…to be continued.